Usually the stage production comes first in classic musicals, but today’s show is a little different. The movie musical Meet Me In St. Louis was actually released in 1944 and the show did not appear on Broadway until 1989! What happened and what historical setting inspired this story and songs? Read on… But be warned – spoilers ahead! 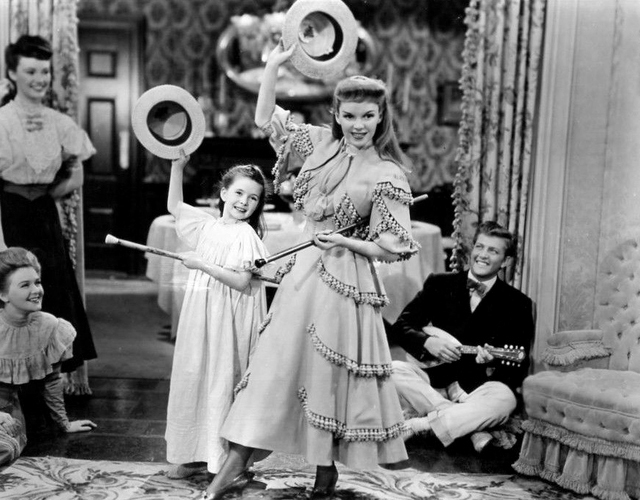 Margaret O’Brien and Judy Garland in the film version. The plot moves through the seasons and calendar holidays with a going-away party for John who’s headed for college, a mishap at Halloween, and a Christmas dance. Trouble occurs aside from the romantic happenings when Mr. Smith announced that the family will move to another city for his job. In the end, he gives in and agrees that they will stay in St. Louis. 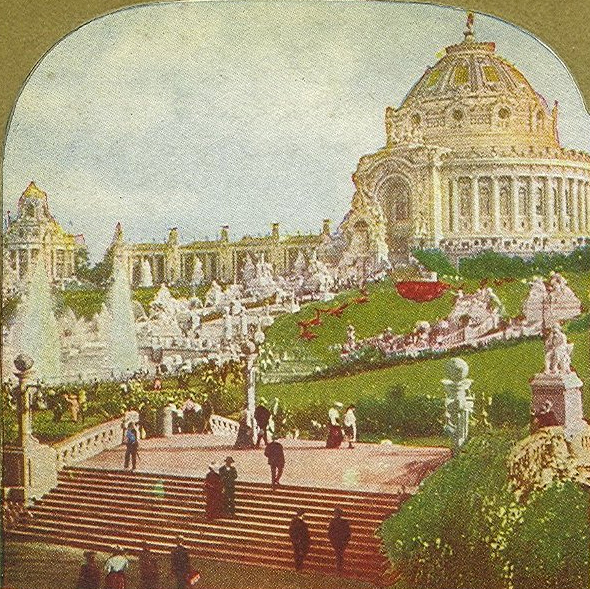 As the family attends the World’s Fair, all conflicts are resolved and the musical ends happily. 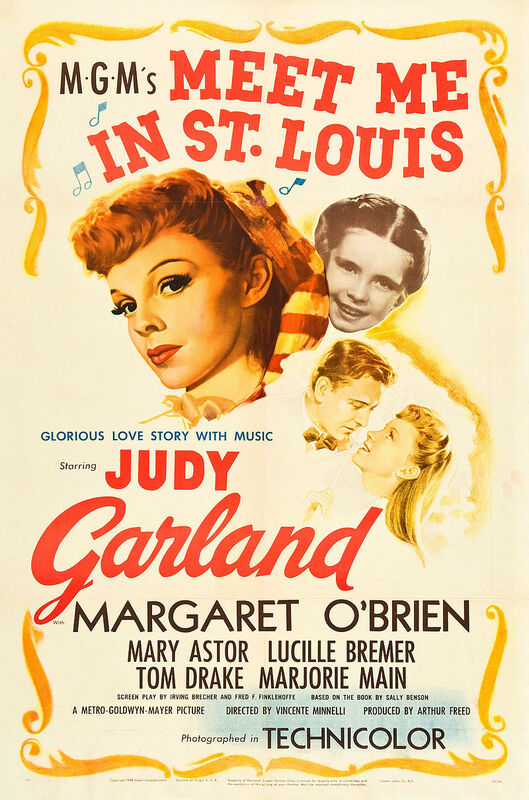 In 1944 Meet Me In St. Louis released as a “musical motion picture,” starring Judy Garland as Esther Smith. The story was adapted from a series of short stories which later became a novel. As a happy story appearing from Hollywood during World War II, the film and music was an instant hit and became the second highest grossing movie of the year. The story and music migrated to stage and a theater on Broadway in 1989, keeping the original story line, though weave more story about the other family members rather than heavily focused on Esther Smith. The show ran for 252 performances on Broadway. 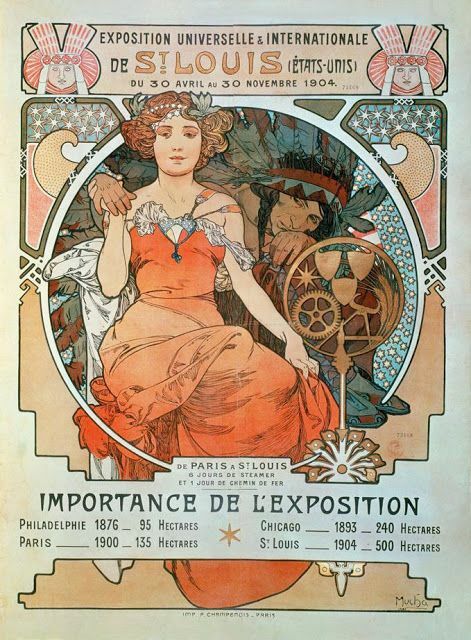 Properly called the Louisiana Purchase Exhibition, this international fair ran from April to December 1904 in St. Louis, Missouri. The exhibition attracted about 60 countries and the majority of the American states as presenters. Approximately 19.7 million people attended the grand event. Scientific and cultural exhibitions brought the wonders of the “modern world” to display. Pop culture and entertainment also exploded as people soaked up the pleasures of the scene. Some of the foods we associate with fairs gained popularity, like waffle cones, iced tea, and cotton candy. Unfortunately, the World Fair – like preceding world exhibitions – had its questionable aspects, like displaying people from foreign countries or people with disabilities or deformities as curiosities. The grand fair was a cultural highlight to the people of the United States and marked the swift introduction of new pop culture and industrial or scientific discoveries in that era. The last decade of the 19th Century was called “The Gay ’90’s” because it was seen as a time of happiness in American culture. Certainly there were plenty of troubles, but the culture presented itself as refined and sophisticated while embracing the fun and challenges of sports, leisure time, and social activities. Tennis matches (that girls joined in! ), dances, carriage rides, holiday celebrations, telephone calls, trolley cars, and other details from this era make their way into the musical. Men and women’s “spheres of influence” were still common, with men earning the money and women keeping the home and this also plays a major role in the film/play’s conflict. The film and play Meet Me In St. Louis gives a fictionalized and happy version of life in turn of the century America through the story of a family and their neighbors. Set against the backdrop of the Louisiana Purchase Exhibition, it reminds us of this unique and special event in U.S. and World History. The film version has been added to the United States National Film Registry for its cultural significance in production and storyline.